As if keeping the floors inside of the home wasn’t difficult enough, try adding a pet to the scenario! Pet owners cannot use just any vacuum cleaner and remove pet hair, as well as dirt and debris from their floor. They need a special vacuum cleaner that is built strong, durable and powerful enough to remove the built-up hair from the floors. That vacuum cleaner is the Bissell PowerEdge Pet Hard Floor vacuum cleaner. I took the time to do the research and determined that this cleaner is the perfect machine for pet owners. What makes this cleaner so amazing? Read on and find out! Bissell PowerEdge Pet Hard Floor Vacuum is a cat or dog-lovers dream come true! The Bissell PowerEdge Pet Hard Floor vacuum cleaner is an affordable stick vacuum. The innovative style is one of the best features. You’ll notice that a “V-shaped nozzle” is on the machine, making it easier to pick up larger pieces of dirt and debris that regular vacuum cleaners may leave behind. While the nozzle is larger it is still capable of picking up the small stuff, too. With Bissell, there is never any dirt left behind. Thanks to the Swivel motion it is easy to clean all of the floor, not just open spaces like with some cleaners. The vacuum moves the way that you want it to move, accessing those hard-to-reach areas like underneath kitchen tables. Although the vacuum is corded it is still easy-to-use. With a 20-foot cord, the stick vac is capable of getting around just like you need it to. It is one of the longest cords you’ll find on a stick vacuum. The small, lightweight design ensures that anyone can easily move it around from area to area. The weight of the vacuum is only 7 pounds, so there’s no reason to keep it sitting still. 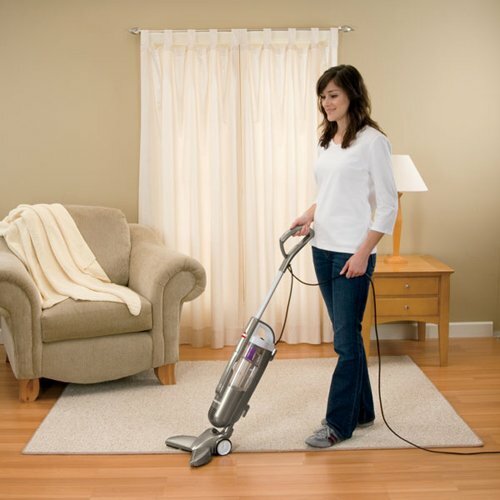 It maneuvers well when it is time to clean, working on both hard surfaces as well as carpet. The V-shape design is great for another reason as well: it helps ensure the optimum suction power is available. You can ensure that even ground in pet hair (and dirt) will be gone from your life with one vacuuming of the floor. And, the design also makes it simple to clean against walls and baseboards. You will find the Bissell PowerEdge equipped with a 5 amp motor. Although this may seem small the tiny machine is very powerful. Bissell prides itself on being able to effectively clean floors, and this machine does not disappoint. On the downside, the PowerEdge is not equipped with HEPA filtration. Many people, especially those with allergies and asthma, count on HEPA filters to protect them and the air they breathe. The vacuum does offer a basic pleated circular filter that protects particles from entering the air as well as cyclonic action to ensure that pet hair, dander, and dirt goes into the cup where it belongs. The canister is easy to remove and empty. And, since it is transparent there is no guessing when it is time to empty the canister. You’ll know when the time to empty comes and can do so without making a mess or getting dirt all over yourself. When it is time to store the Bissell PowerEdge you’ll be pleased to know that it sits upright on its own. This eliminates time and hassle trying to prop the device up against something as well as protects it from falling. Put it in the closet and go! Thanks to the QuickRelease Cord Wrap, winding up cords only to have to rewind to get it right is a thing of the past. One simple push of the button and you’re done! The cord automatically winds itself up and you are ready to get on to better things in your life. There is no better vacuum cleaner out there for the price that will pick up pet hair. You’ll be amazed! You may not even realize there is a pet inside of the home once you’ve cleaned with the Bissell. And, with the ability to quickly and easily clean other dirt from your floors, the Bissell PowerEdge is a vacuum cleaner well worth the small price tag. There is a one-year warranty included with the vacuum cleaner. This manufacturer’s warranty protects against parts and labor damage. What’s Inside Of The Box? What are Others Saying about the Bissell PowerEdge Hard Floor Vacuum Cleaner? Amazon customers gave this vacuum cleaner a 4.5 out of 5 stars. Most users were pleasantly pleased with the overall quality and value of the vacuum cleaner. Here are what a few people had to say. If you would like to read more reviews you can do so by clicking “Check Amazon Customer Reviews” at the bottom of the page. You’ll be taken to Amazon where you can have your fill of more than 300 customer reviews as well as place your order when you are ready. If interested there are also many other spots on the web in which you can obtain reviews of the PowerEdge. All in all, customers were pleased with the vacuum cleaner and all that it has to offer. The Bissell PowerEdge Pet Hard Floor Vacuum cleaner is available right now for purchase at Amazon. If you are a pet owner this is the one cleaner that you cannot leave behind. It will simply amaze you time after time. Amazon is truly the best place to purchase the Bissell PowerEdge. They offer the lowest price on the cleaner as well as fast, free shipping.